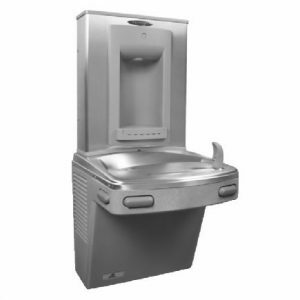 Oasis Model PSBF includes PAC non-refrigerated drinking fountain and the VersaFiller Sports Bottle Filler with independent manual activation; lower unit has front and side push pads to activate the manual flow of water for the cooler. VersaFiller alcove and activation button contain Freshield, which utilizes a silver-based antimicrobial compound that reduces the growth of micro-organisms and mildew to protect the surfaces from discoloration, odors and degradation. Basin is designed to eliminate splashing and standing water. Bubbler is a Low Flow, one piece construction with flexible guard and operate between 20 and 120 PSI. 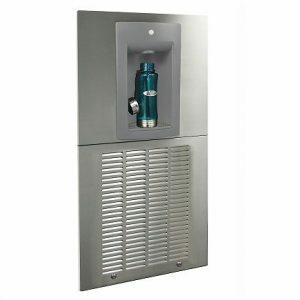 VersaFiller cabinet finish is Brushed Stainless Steel. PAC cabinet finish is Sandstone Powder Coated paint on galvanized steel or brushed stainless steel. Complies with ANSI A117.1 and ADA. Listed by Underwriters’ Laboratories to U.S. and Canadian standards. Complies with ANSI/NSF 61G. 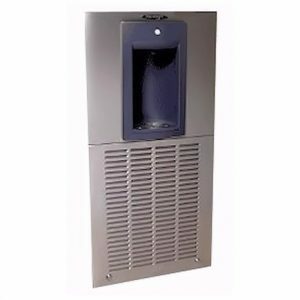 These models satisfy CABO/ANSI A117.1 and these water coolers comply with ADA requirements when properly installed. Units also meet guidelines for children’s accessibility providing the floor to orifice height is 30 inches and proper clear floor space is provided for frontal approach. Stainless Steel Top One Piece, Low Flow, Flexible Bubbler Guard. Product Certified to NSF/ANSI Standard 61,Annex G (AB1953). Four Push Pad Manual Activation on lower water cooler. External Stream Height Adjustment on Lower Unit. VersaFiller Cabinet Finish is Brushed Stainless Steel. Standard Versacooler (bottom unit) Cabinet Finish: Sandstone Powder Coated Paint on Galvanized Steel. Optional finishes (at additional cost): Brushed Stainless Steel.